WARNING: This might be a spoiler for some meaning that you might reconsider reading the book. Anyway, read at your own risk. 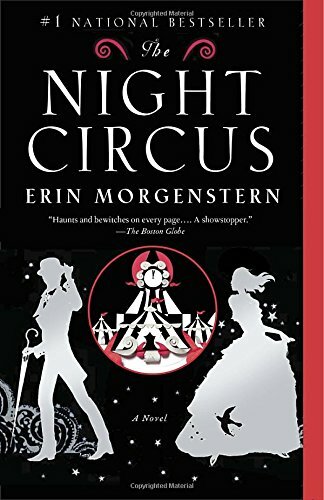 Would I recommend The Night Circus? The answer would be, "Not really if you're looking for a good fantasy/mystery story." It's pretty tell-y rather than show-y. Basically, a bit like a textbook. There's also a lot of going back and forth between time periods and sometimes I had to calculate how old some of the recurring characters were because the author didn't make the age explicit when age was most definitely important. There were also short little one-page chapters where it's suddenly written in second person explaining certain tents within the circus and what you will see or feel when you go in there. Most of those explanations had nothing to do with the events playing out in the story and sometimes I almost wanted to skip them. Because of so many characters going back and forth in time (sometimes they were young, sometimes they were old...) and because it's written in present tense it was hard to connect to any of the characters. Even within a chapter the POV would change and I got a bit thrown off by that. The ending was kind of, what I call, cheat ending. Just make it that they all don't mind the way things have become and no, we are never going to find out some of the biggest mysteries in the story. EVER. Personally, I think that if you have made a big deal about this man in the gray suit, it might be important to elaborate on him more. Give more hints and stop going into this "I'm not telling you *sings*" thing. It's like a pet-peeve of mine. It annoys and frustrates me. Critical remarks aside...here's what I thought was good. 1. The overall vibe in the story. A sort of whimsical, fantasy, Victorian vibe which I like. 2. The ongoing mystery (although most of it wasn't solved) kept me reading for more (because for me, I don't mind a bit of textbooky books). And, finally, I applaud the author for not getting confused with all the back and forth between characters, between times, and even between POVs. Again, will I recommend it? No. Not really. Not for if you were looking for a fantasy novel. This novel is more like, "Read just for the sake of reading it and being able to say that you have read it and experienced it."